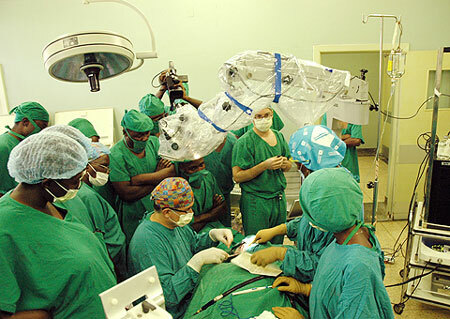 The high rate of brain drain is continuing to wound Uganda’s health sector with fresh revelations indicating the country is short of over 3,300 surgeons. An expert said many people who would have survived treatable surgical conditions like cataract blindness, hernia, clubfoot and injuries end up dying due to inadequacy of surgeons in the country. “Every year, Makerere University, other institutions and hospitals pass out surgeons. But due to low pay, many quit the country for greener pastures abroad,” said Dr. Edward Naddumba, the secretary general of the College of Surgeons of East, Central and Southern Africa (COSECSA). Other potentially productive people become disabled and destitute because of treatable surgical conditions, he said. Naddumba made the remarks while briefing New Vision online on COSECSA’s efforts to improve the numbers and working conditions of surgeons in sub-Saharan Africa. The efforts include offering specialized postgraduate surgical training at major hospitals like Mulago, Nsambya and Masaka. The college passed out four graduates at its first graduation ceremony in 2004. About 113 trainee surgeons are to sit the COSECSA exams this year, 51 of whom are in their final year. The college charges $1700 (about sh4.2m) as entry, examinations and graduation fees. His revelations come amidst a public outcry over the underfunding of the health sector. A report by Makerere University Medical School two years ago revealed that health spending in Uganda covers about a third of what the country needs to meet its minimum healthcare package. It said Uganda spends only $14 per-capita on health. Of this, $9 is out-of-pocket and $5 from public sector (government and donor funding). Today, less than 100 specialist surgeons available for 34 million Ugandans. Yet, as the country’s health system remains in a coma, the Government still spends at least $150m (about sh368b) annually treating top government officials abroad. This amount is nearly half of the combined budgets of health and education ministries. Makerere’s development expert Prof. Augustus Nuwagaba recently argued that Uganda’s problem is not lack of medical practitioners but poor remuneration. “Almost half of the 40,000 Ugandan professionals in North America are health personnel, which means our problem is not the human resource,” he said. Plot 4008, Justice Road, Canaan Sites, Nakwero, Gayaza - Kalagi Road.